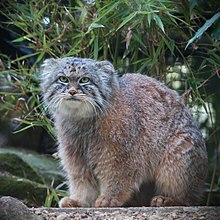 The Pallas's cat (Otocolobus manul), an aa cried the manul, is a smaw wild cat wi a broad but fragmentit distribution in the gresslands an montane steppes o Central Asie. It is negatively affectit bi haibitat degradation, prey base decline, an huntin, an haes tharefore been clessifee'd as Near Threatened bi IUCN syne 2002. The Pallas's cat wis named efter the German naituralist Peter Simon Pallas, wha first descrived the cat in 1776 unner the binomial Felis manul. ↑ 1.0 1.1 Ross, S.; Barashkova, A.; Farhadinia, M. S.; Appel, A.; Riordan, P.; Sanderson, J. & Munkhtsog, B. (2016). "Otocolobus manul". IUCN Reid Leet o Threatened Species. Version 2016-3. Internaitional Union for Conservation o Naitur. ↑ Wozencraft, W. C. (2005). "Order Carnivora". In Wilson, D. E.; Reeder, D. M. Mammal Species of the World (3rd ed.). Johns Hopkins University Press. p. 535. ISBN 978-0-8018-8221-0. OCLC 62265494. ↑ Pallas, P. S. (1811). Felis Manul. In: Zoographia Rosso-Asiatica, sistens omnium Animalium in extenso Imperio Rossico et adjacentibus maribus observatorum recensionem, domicillia, mores et descriptiones, anatomen atque icones plurimorum. Petropoli, in officina Caes. Acadamiae scientiarum. Vol. 1 : 20–23. This page wis last eeditit on 4 Apryle 2017, at 00:22.